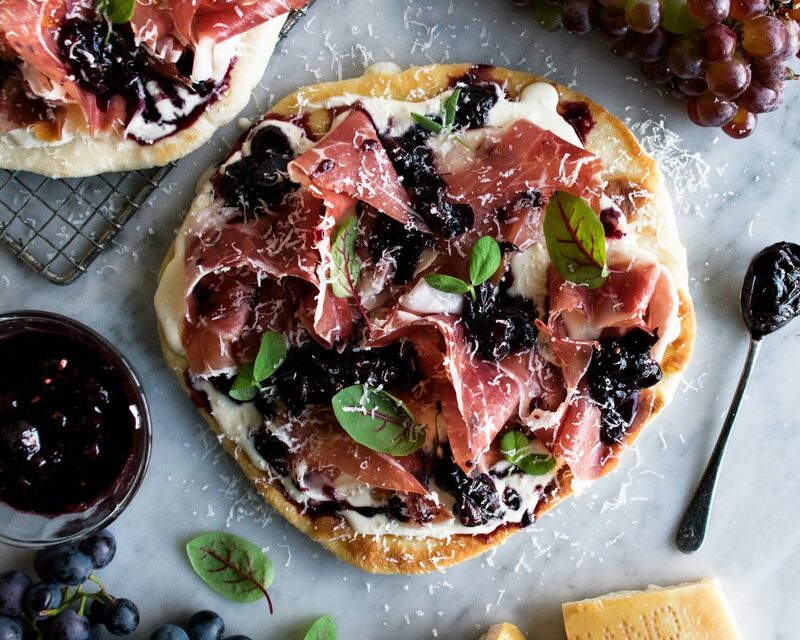 Surprise and delight your family and friends with this Prosciutto Piadina with Parmesan Fonduta & Balsamic Grapes recipe by Kayla Howey at The Original Dish. Inspired by the flavors from the Emilia Romagna region of Italy, this dish brings together the smoothness of the Prosciutto di Parma, the nuttiness of the parmesan and the sweetness of the balsamic to create a delicious and beautiful prosciutto appetizer perfect for any occasion. Yes, this recipe may sound complicated, but you can make this prosciutto appetizer at home! Piadina is a traditional Italian flatbread that only requires a few ingredients, while the parmesan fonduta is just a fancy way of saying cheesy topping for the flatbread. And you don’t have to go to Italy for the Prosciutto di Parma. You can find it in the deli section of most Italian markets and grocery stores. Combine the grapes, balsamic vinegar, water, and honey in a small saucepan. Stir the mixture and let it come to a boil over medium-high heat. Reduce the heat to low and let the liquid simmer until it’s syrupy and the grapes have burst, abut 20-25 minutes. Turn off the heat and reserve until serving. Meanwhile, add the cream to a medium saucepan. Bring the cream to a simmer over medium heat. Reduce the heat to low and let the cream gently simmer for 8 minutes. Gradually add the freshly grated parmesan cheese, whisking until fully incorporated. Let the fonduta cook for 2 more minutes over the lowest possible heat. Transfer the fonduta to a heat-safe bowl. Continue to whisk often as the fonduta cools so it stays nice and smooth. It should be served warm. While the grapes and fonduta are working, start the piadina dough by combining the flour, salt, and baking powder in a large mixing bowl. Mix well. Add the softened lard (or shortening) and work it into the dry ingredients using your fingertips. You want to somewhat “rub” the lard into the flour so that you’re left with a crumb-like mixture (it is fine to have lumps). Make a well in the mixture and pour in the warm water and milk. Use a wooden spoon or your hands to incorporate the liquid into the dry ingredients until a dough comes together. Turn the dough out onto a floured surface and knead for 5 minutes until smooth. Roll the dough into a log and divide the dough into 4 pieces. Roll each piece into a ball. Cover the dough balls with a towel and let rest at room temperature for 5 minutes. Heat a cast-iron skillet over medium heat. When the skillet is hot, add enough olive oil to just barely coat the bottom. Roll one dough ball out at a time until it’s about 1/8” thick. Lift the dough circle and place it into the hot oil. Cook on both sides until golden brown. Season with a good pinch of salt. Transfer the piadina to a plate and cover to keep warm. Repeat the process to cook all of the dough. Spread the warm parmesan fonduta onto the piadina. Delicately arrange 4-5 slices of prosciutto on top of each. Spoon the balsamic grapes (plus the syrupy liquid) over top. Grate extra parmesan cheese as a finishing touch. Eat immediately.